The long-delayed presidential run-off in Guinea has now been scheduled for 19 September, Secretary General of the presidency Tibou Kamara has said. The vote, initially due to take place on 18 July, was held up while officials investigated allegations of fraud. No-one won a clear majority in the landmark 27 June first round. Guinea has been governed by a military junta for the 18 months since the death of its long-time leader, Gen Lansana Conte. 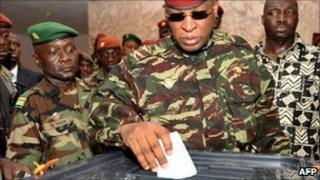 The second round pits former Prime Minister Cellou Dalein Diallo, who gained 40% of the vote, against veteran opposition leader Alpha Conde, who won 21%. The election was the first democratic vote in the mineral-rich West African state since it gained independence from France in 1958. The country descended into chaos last September after troops killed more than 150 pro-democracy demonstrators. A few months later the junta leader was shot and injured by an aide implicated in the massacre. Guinea is the world's largest exporter of the aluminium ore bauxite and also has important deposits of iron ore. Despite its mineral wealth, the country is one of the poorest in West Africa.